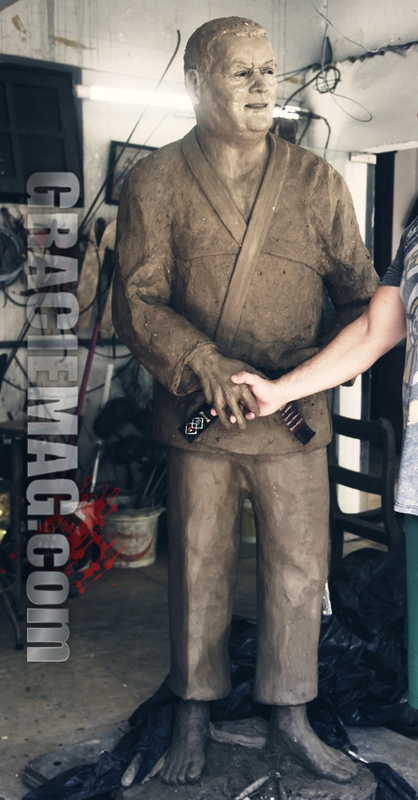 The first image of the statue in honor of Carlson Gracie has been published. The sculpture will be installed in the Rio de Janeiro neighborhood of Copacabana thanks to an initiative by friends and students, who have a plan on how to raise the funds required. Already given the go-ahead by the Secretariat of Conservation of the City of Rio de Janeiro, the statue will be placed on Shimon Peres Square, on the corner of Figueiredo de Magalhães and Tonelero streets, near the Siqueira Campos subway station. The picture is of a partial clay version of the statue, which will be used to make the mold for the production of the statue in bronze. The final work will weigh around 200kg and be made by Edgar Duvivier, the artist responsible for the statue of Clarice Lispector in nearby Leme.